What Should the Florida Panthers Do With the First Overall Pick? One thing is clear, changes needed to be made, and the Florida Panthers struck gold when they won the first overall pick through the NHL Draft Lottery. They were one of the worst teams in the NHL and could benefit from either trading the pick or using it at the draft. Lucky for the Panthers, this draft has plenty of talent to choose from and the Panthers could benefit from drafting at any point in the order if they could get some value for the first overall pick. After trading for Roberto Luongo, the Panthers have one less worry going into next season. Tim Thomas was a short-term fix and Luongo, who was once the face of the franchise, is signed till 2022. Moving on to other positions on the team, the Panthers could use some upgrades. The last thing the Panthers need is another young player who requires ample time to develop, which opens the door to trading the pick to make the team better now. With that said, the Panthers have a few options in the draft but could also bring in some much needed proven talent to avoid the time aspect with young prospects. The main concern with the Panthers using the first overall pick is the likelihood of an NHL-ready prospect. Judging by the talent available in this year’s draft class, there is a very limited group of players who could make a difference in the coming season. Here is a look at Aaron Ekblad, the only player the Florida Panthers should consider choosing in this year’s upcoming draft. 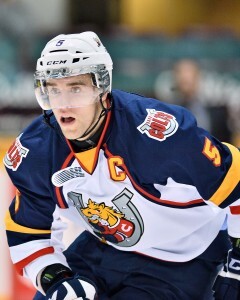 Considered one of the best prospects in the world for quite some time, Aaron Ekblad has a combination of size and skill that helps make him one of the more NHL-ready players. He had an action-packed year this season and gained a lot of experience with the Barrie Colts, where he averaged almost a point-per-game. He scored 23 goals and 30 assists in his third season with the Colts and, though he has one more season of junior eligibility, could start in the NHL out of training camp. He also played in the 2014 World Junior Championships and U18 Tournament for Canada. With the Panthers current needs, there may not be a better player to choose in the draft. He’s very experienced for his age, has shown great skill at both ends of the ice, and is by far the best defenseman in the draft. The only concern with Ekblad is the longevity of his growth. Defenseman always need extra time to develop skills for the NHL and the offensive game usually takes a while longer. The Florida Panthers should have plenty of space on their blueline, but they will want to perform a lot better next season. If Eklbad were to play poorly in the first few games, the Panthers would surely consider sending him down, creating an unwanted roster opening with an already depleted group of players. Nevertheless, Ekblad is by far the best player in this year’s draft for the Panthers, and if they choose to keep the pick, he will likely be the first player chosen in the NHL Entry Draft. The Panthers currently have a plethora of first rounders who still need to make a name for themselves in the NHL. Jonathan Huberdeau, Nick Bjugstad and Aleksander Barkov seem to be the corps of the forward talent, while Erik Gudbranson and Dmitry Kulikov are still finding their ways on the blueline. When you throw in Brandon Pirri, Jimmy Hayes and Dylan Olsen, the Panthers’ young players look very promising on paper. If the Panthers want to succeed next season, they will need to chase some already proven players with the skills to succeed consistently and immediately. By July 1st, the Panthers will need to decide on the players they want to keep for the 2013-14 season. Kulikov, Gudbranson, Olsen, Hayes and Pirri are all restricted free agents who should stick with the Panthers going into next season. The Cats also have a few notable prospects at the NCAA level, which only increases the value of their prospect pool. With so many young and unproven players on the roster, the best option would be to bring in some much needed experience and leadership, especially up front, that can help develop this team into a contender. Here are the three best trading partners for the Florida Panthers. The Capitals should be interested in this pick for one reason, Ekblad. The Capitals have a questionable blueline that has yet to become a force in the NHL. The Capitals possess tremendous firepower, but lack the defensive players to truly make a difference. Many of their defensemen have been on the team for a while, and while their efforts have been respectable, they lack a truly reliable six-man unit. Will Ekblad make a world difference right away? Probably not. But the Caps have a good enough team to let him develop over time and still remain a competitive team. While the Capitals would be a huge beneficiary of Ekblad’s services, they do not have much to give in return. They have awaited the arrival of Evgeny Kuznetsov for quite some time and may want to hold on to him for now. Another option would be Marcus Johansson, but either player would probably be in a package for the first overall pick. With that said, it remains to be seen if anyone has the right price for the high of a pick, especially in such a deep NHL draft. Every season it seems the Devils are willing to put the same team on the ice and see what happens down the stretch. Adam Henrique is looking like a great future player in the NHL, while Patrik Elias and Jaromir Jagr are on their way out. Having drafted Adam Larsson a few seasons ago, the Devils have a few young players to build around while their veterans grow older. Would Elias or Jagr move to Florida? It would all depend on the type of contender they are going into next season. Travis Zajac, Ryane Clowe, Anton Volchenkov and Elias all have no-trade clauses, which makes the Devils another tough team to trade with if their players have no interest in playing for the Panthers. There are very few players on the Devils’ roster who could be worthy of the first overall pick. However, a nice package with some of the Panthers’ unneeded assets could be a workable deal between the two teams. Nevertheless, it will take a lot for the Panthers to trade their pick, but the Devils have some attractive pieces that could help build the Panthers for the present. Is there a better team for the Panthers to trade with right now? The Canucks blew up their team and are in the midst of getting rid of their most experienced players. The Panthers already benefited from the Luongo trade, and the first round pick could be another tempting piece for the Canucks. They are in need a new young talent and any one of the top three players would be a solid option. Sam Bennett, Aaron Ekblad or Sam Reinhart. 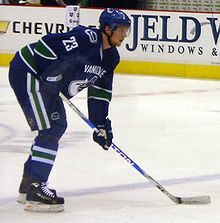 The biggest problem with the Canucks as a trading partner is most of their big names have a no-trade clause. Ryan Kesler, Alex Burrows and Alex Edler are probably the most movable assets on the Canucks, but playing in Florida is not the most popular choice for players. It would all depend on their happiness in Vancouver and their willingness to play for an up-and-coming team instead of a contender. However, if they were to waive their no-trade clause, maybe joining their ex-teammate in the Sunshine state is the best thing for their long-term future. Whether the Panthers choose to trade or keep the pick, they will have all the power in the world come draft day. Ekblad could be a solid fit, while fishing for the best offers may get them what they need right now. The first overall pick is extra special with so much talent in this year’s draft, and it will be intriguing to see if the Cats choose to use it or trade it. With that said, if immediate success is their current goal, the Panthers will need to weigh their options before draft day to ensure they make the right decision.